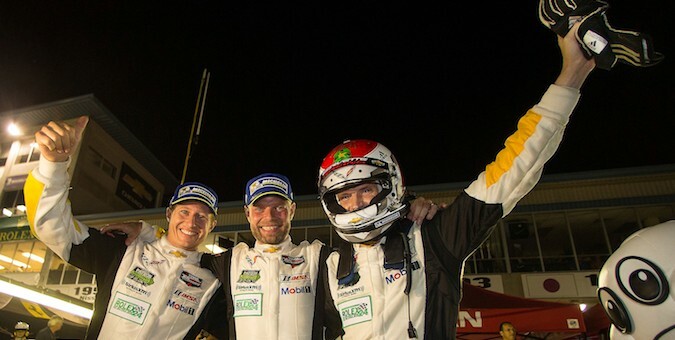 Corvette Racing scored their ninth win at the 12 Hours of Sebring since 2002 on Sunday, with drivers Ryan Briscoe, Antonio Garcia and Jan Magnussen driving the No. 3 C7.R to victory in the GTLM class. The result marked Corvette Racing’s second consecutive win so far this year, with the No. 3 car also earning a GTLM victory at the 24 Hours of Daytona in January. The No. 3 Corvette crossed the finished almost a full minute before the next fastest car. This rather significant lead was the result of a well executed fuel strategy by the Corvette Racing team which saw them pit with 54 minutes left in the race. From there, Garcia drove a consistent stint to pass the two leaders, who we’re having car trouble. Occasional Corvette driver Ryan Briscoe spun the car early on, however he was soon able to recover from the mistake by posting the fastest laps of the race. Some quick pit work and a clean turnover to Magnussen helped the team gain two positions while the course was under caution, setting them up nicely for the restart. Corvette Racing’s No. 4 C7.R, driven by Oliver Gavin, Tommy Milner and Simon Pagenaud, was forced to retire from the race with less than two hours remaining. The car experienced more than one problem throughout the race, with an engine belt issue and a broken brake pedal return spring. The result was especially disappointing for the team, as the No. 4 car looked poised to finish on the podium earlier on. Chevy didn’t just experience victory in the GTLM class. Pole sitters Christian Fittipaldi, Joao Barbosa and Sebastien Bourdais drove the No.5 Action Express Racing Mustang Sampling Corvette DP to an overall win, lapping the entire field for the first time in TUDOR history. They were joined on the podium by two other Corvette DP teams, the No. 90 VisitFlorida.com car and the No. 10 Konica Minolta/Wayne Taylor racing car. We’ll find out if Chevrolet can perform a repeat of this weekend when the series heads to the Tequila patron SPortscar Showcase in Long Beach on the first weekend of May.